Lashkari gives us a tour of his kitchen. 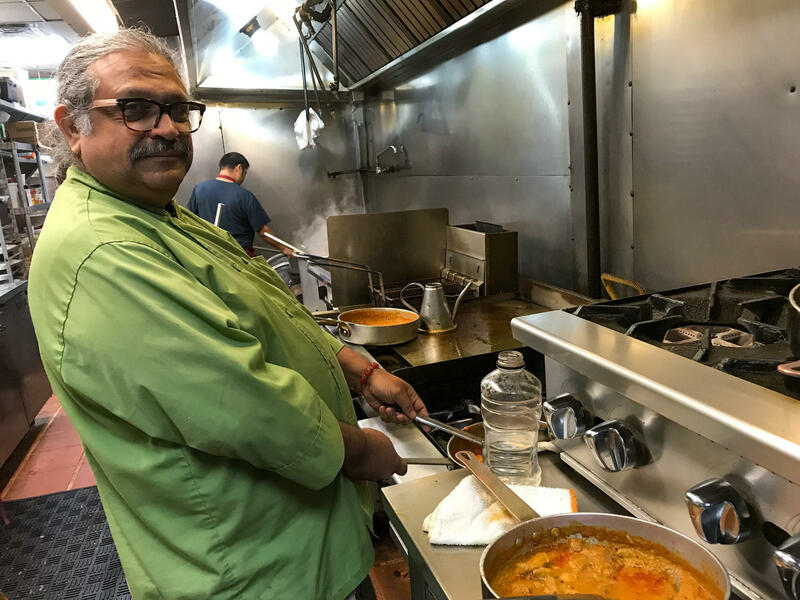 He's known for some of the best Pakistani and Indian food in Houston. His cooking borrows happily from other cultures. Chef Kaiser Lashkari greeted NPR to his restaurant, Himalaya, with a spread including garlic naan, butter naan and saag paneer. His restaurant has become an institution in multi-ethnic Houston. Lashkari went to medical school in Pakistan for several years before realizing his true passion was cooking. He's shown here with his wife, Azra Babar Lashkari. "Let's feed you first, that's what we are all about, to put a smile on your face with good food," he says. That food has made this humble eatery among the best restaurants in the city, topping the lists of every Houston publication and more recently, after a visit from Anthony Bourdain in 2016, the country. Creamy chai is set on the table then vegetable fritters, and spicy samosas. "Just grab it Indian style with your hands," Lashkari advises. "No formalities. All fat-free, sugar-free, cholesterol-free and zero calories. Most of it is doctor recommended for weight loss." He is a gregarious host. "If I was not a chef, I would have been a part-time stand-up comic I think," he says. Lashkari grew up in Karachi, Pakistan, and studied medicine. He was three and half years into medical school when he told his parents, "This is not where my heart is," he says. "And they thought I had flipped my noodle. Because everybody, every Indian and Pakistani parent in the '80s, wanted their kid to either become a doctor, lawyer or engineer. Nobody had heard of being a chef. I broke my parents heart by not becoming a doctor." But Lashkari's heart was in cooking. He moved to America, got his masters' degree from The Conrad N. Hilton School of Hospitality at the University of Houston and settled in the city. At first, he was mostly catering Indian weddings, and then 14 years ago he gambled everything on this place. "When we came here in 2004, I had 11 hundred dollars in the bank," he says. This was a Colombian restaurant that we bought over." He kept a painting of a traditional Latin Market market scene, with a tiny cross perched on an archway. It dominates the whole wall. "This is the story," Lashkari explains. " In Islam, you can't remove a picture that has a cross in it. That was my wife's understanding. ... And she said. 'Don't ever remove this.' And this restaurant became very lucky for us. We, from being hand to mouth, we became self-sufficient, so this proved to be a lucky painting. Plus, this was a colorful painting and it was all we could afford at the time. So we want to keep it and we want to keep the cross as long as I'm alive and kicking." It's a sign of how so many communities have built Houston into what it is today — influencing each other, melding into something unique. Lakshari has applied that to the dishes he serves: His signature chicken curry, cooked in huge metal pots in his sweltering fragrant kitchen, is made with Mexican tomatillos and cilantro. It's incredibly delicious and we ate that along with the best sag paneer, an Indian spinach and cheese dish, that I've ever tasted. "We do a lot of fusion right now," the chef says. "This restaurant is famous for its fried chicken. It's fried the Southern way, but the raw chicken is marinated with Indian spices. My white gravy is made with cashew nuts and almonds and coconut. So it looks like a white gravy of a chicken fried steak, but it's different." Think of it as Pakistani and Indian food with deep Texas roots. Lashkari says you can trace Houston's transformation into one of America's most diverse cities through its food scene – "more ethnic restaurants coming onto the scene, more Vietnamese restaurants, more Arabic restaurants, more Japanese restaurants, more Chinese restaurants. Besides that, there has been a great influx of Indian and Pakistani population. So yes, things have changed. One thing hasn't changed: I still don't like Sloppy Joes." When asked about talk that he's thinking of retiring, Lashkari paraphrases Al Pacino's famous line in The Godfather: Part III: "Every time he wants to quit the mafia business, 'they pull me in.' Every time I want to retire, some customer comes in and tells me how much he enjoyed the food. And there I am, back to the drawing board, trying to think of something new to make and put on the menu." But if he doesn't retire? 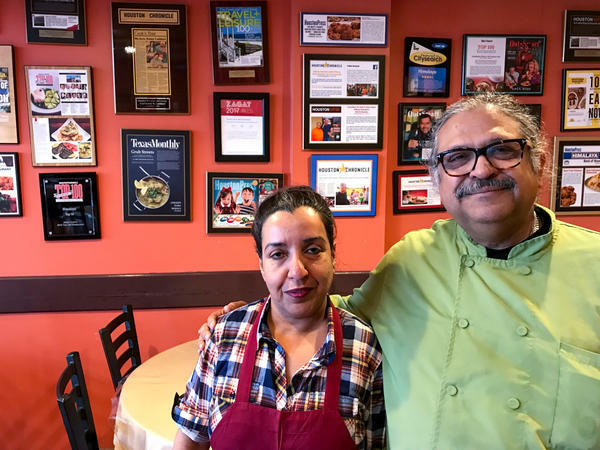 "Part of me wants to open a second place where everything is Indian- and Pakistani-style — hamburgers, Indian- and Pakistani-style fried chicken, pizza. I've already done some tacos, some tamales with the Indian spices. So, the sky's the limit. As long as there are other ethnic foods to draw from, I'll be busy." Just off a Houston freeway, in a strip mall with an Indian tailor and a South Asian grocery store, is a small restaurant with an outsized reputation. It's called Himalaya, and its chef and owner is a Houston institution. KAISER LASHKARI: How are you? LASHKARI: Good. I'm chef Kaiser. Would you like some hot tea? Hot chai? Indian chai? Chef Kaiser Lashkari is a large man with a bushy, salt-and-pepper mustache. He's constantly in motion - greeting clients, inspecting steaming dishes carried by busy waiters, calling out to his wife, overseeing the kitchen. He offers us food before we've even sat down. LASHKARI: Let's feed you first. That's what we're all about - to put a smile on your face with good food. GARCIA-NAVARRO: That food has made this humble eatery among the best restaurants in the city, topping the lists of every Houston publication and more recently, after a visit from Anthony Bourdain in 2016, the country. We'll let you choose what we eat. LASHKARI: OK, wonderful. Thank you. GARCIA-NAVARRO: Creamy chai is set on the table - then vegetable fritters and spicy samosas. LASHKARI: One each. Just grab it Indian-style with your hands. No formalities. All fat-free, sugar-free, cholesterol-free and zero calories. LASHKARI: Most of it is doctor recommended for weight loss. GARCIA-NAVARRO: He is a gregarious host. LASHKARI: If I was not a chef, I would have been a part-time standup comic, I think, you know? GARCIA-NAVARRO: Kaiser Lashkari grew up in Karachi, Pakistan. And he studied medicine. LASHKARI: I was in med school in Pakistan. And I had finished three and a half years. I had two more years to go to become a doctor. I told my parents that this is not where my heart is. They thought that I had flipped my noodle because everybody - every Indian and Pakistani parent in the 80s wanted their kid to either become a doctor, lawyer. Or No. 3 option was engineer. Nobody had heard of being a chef. I really broke their heart by not becoming a doctor. GARCIA-NAVARRO: But his heart was in cooking. He moved to America, got his master's degree from the Conrad N. Hilton School of Hospitality at the University of Houston. And he settled in the city. At first, he was mostly catering Indian weddings. And then 14 years ago, he gambled everything on this place. LASHKARI: When we came here in 2004, I had $1,100 in the bank. This was a Colombian restaurant that we bought over. GARCIA-NAVARRO: He kept the Colombian restaurant's painting of a traditional Latin American market scene with a tiny cross perched on the archway. It dominates the whole hall. LASHKARI: So this is the story. In Islam, you can't remove a picture which has a cross in it. That was my wife's understanding. She - that's what she gave me to understand. And she said, don't ever remove this. And then this restaurant became very lucky for us. We - from being hand to mouth, we became self-sufficient. So this proved to be a lucky painting. Plus, this was a colorful painting, and this was all we could afford at the time. So we want to keep it, and we want to keep that cross as long as I'm alive and kicking. GARCIA-NAVARRO: It's a sign of how so many communities have built Houston into what it is today - influencing each other, melding into something unique. Lashkari has applied that to the dishes he serves. His signature chicken curry, cooked in huge metal pots in his sweltering, fragrant kitchen, is made with Mexican tomatillos and cilantro. It's incredibly delicious. And we ate that along with the best saag paneer, a spinach and cheese dish, that I have ever tasted. LASHKARI: We do a lot of fusion right now. This restaurant is famous for its fried chicken. It's fried the Southern way, but it's - the chicken - the raw chicken is marinated with Indian spices. My white gravy is made with cashew nuts and almonds and coconut. So it looks like a white gravy of the chicken-fried steak, but it's totally different. 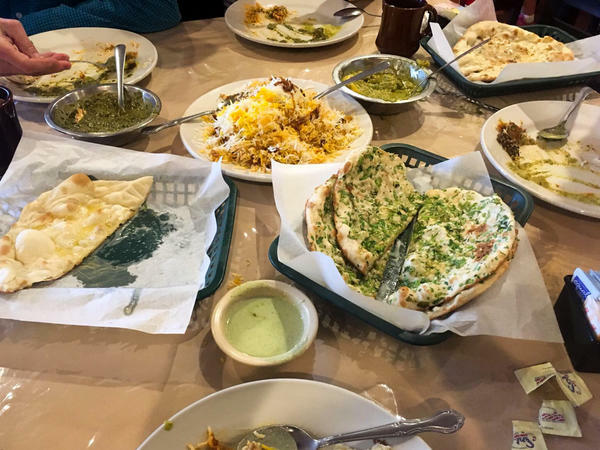 GARCIA-NAVARRO: So Pakistani and Indian food with deep Texas roots. GARCIA-NAVARRO: One of the things that we're looking at is how multicultural Houston is and how many different types of communities live here. Have you seen that change over time? LASHKARI: Yeah, it's become more diverse - more ethnic restaurants coming in onto the scene, more Vietnamese restaurants, more Arabic restaurants, more Japanese restaurants, more Chinese restaurants. Besides that, there has been a great influx of Indian and Pakistani population. So yes, things have changed. One thing hasn't changed. I still don't like sloppy Joes. GARCIA-NAVARRO: I hear that you're thinking of retiring. GARCIA-NAVARRO: I was about to say. LASHKARI: ...A part of me wants to open a second place where everything is Indian and Pakistani-style hamburgers, Indian and Pakistani-style fried chicken, Indian and Pakistani-style pizza. I've already done some tacos, some tamales with the Indian spices. So sky's the limit. As long as there are other ethnic foods to draw from, I'll be busy. GARCIA-NAVARRO: That's chef Kaiser Lashkari, speaking at his Houston restaurant, Himalaya. LASHKARI: Save a little space for the desserts. Transcript provided by NPR, Copyright NPR.